[SFMM] – In 2013 Six Flags Magic Mountain is going Full Throttle with another world-record: the tallest, fastest looping roller coaster in the world. Unlike traditional coasters, this unique, one-of-a-kind triple launch coaster will take the coaster experience to the next generation with a never-been-done-before launch up and over a “Top Hat” that traces the outside of a world-record 160-foot loop — plus a zero to 70 miles-per-hour acceleration on two forward launches and one backward launch into and out of an underground tunnel. Your record-breaking adventure will take place through the park’s distinctive mountainous terrain onboard sleek trains that suddenly accelerate from zero to 70 miles-per-hour in the first of three launches, sending you blasting through the first inversion, the inside of the world-record 160-foot tall loop. You’ll then enter into a high-banked curve to the right and then to the left as you approach the second gut-wrenching inversion — a Dive Loop that rapidly drops you into a dark underground tunnel. After a brief stop, you’ll suddenly be launched backwards up to the high point of the Dive Loop where you’ll be dropped and magnetically launched a third time, racing out of the tunnel and through a high G-turn to the left. 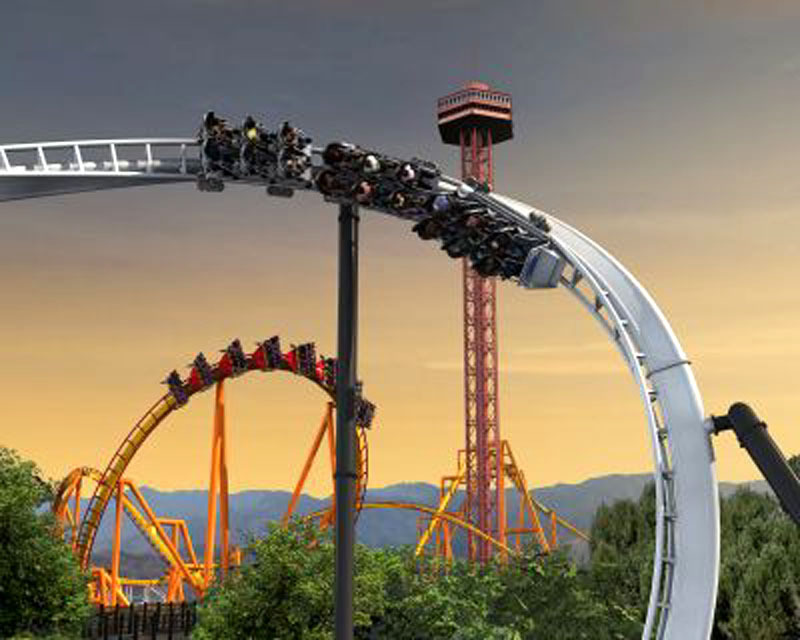 You’ll then shoot up and over the outside of the World Record loop, where you’ll experience significant air time and a breath-taking view of the park as you drop back down to Earth, rapidly decelerating and taking the final 180-degree turn to the left, returning to the station where you can catch your breath. Full Throttle will be located near the front of the park in a newly themed five-acre section where guests will experience high-energy action through fast-paced imagery, sound and lights. With this addition, Six Flags Magic Mountain, the Thrill Capital of the World, firmly holds the coveted “Coaster Capital of the World” crown — with a total of 18 roller coasters — more than any other theme park on the planet. Full Throttle is the perfect addition to the park’s coaster collection, joining other adrenaline-pumping coasters, including Tatsu — the tallest, fastest and longest flying coaster in the world; X2 — the world’s first and only 5th dimensional coaster; Apocalypse — the next generation of wooden coasters; and Goliath — the “giant among giants” mega coaster.